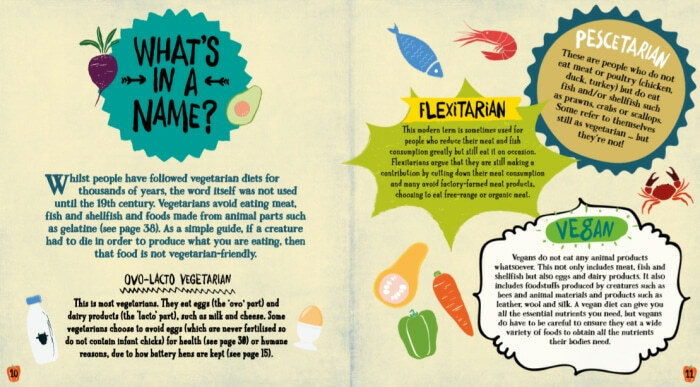 A quick guide to what a vegetarian diet is and what to expect in the book. Did you know there are thought to be some 375 million full-time veggies worldwide? Have a look at vegetarianism through history and find out about some famous historical veggie peeps. Find out the different terms for vegetarians and those on diets where they cut out meat regularly or cut out meat but not fish. There's also a little bit about being vegan. This chapter covers why people follow a vegetarian diet, how the planet is harmed by a meat laden-laden diet, and it also looks at pollution and world hunger. Covering those commonly asked questions, that all vegetarians are familiar with being asked. Following a vegetarian diet is generally healthier, but only if you know what you're doing. 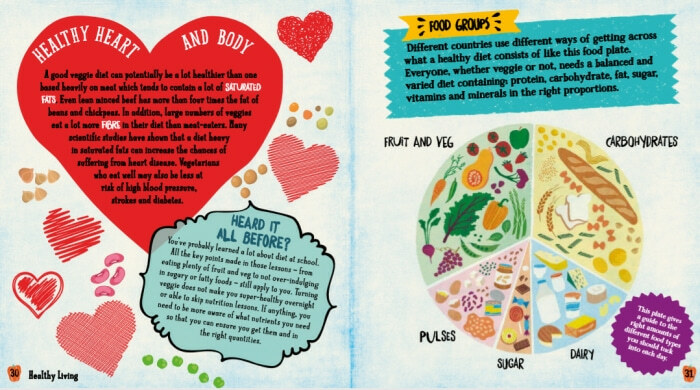 This chapter explains how to follow a healthy diet. It covers food groups, finding replacement ingredients, nutrients, exotic food replacements and which products may not be veggie. This chapter covers how to get started and not be daunted by it all, with practical advice and tips. There are suggestions on what to stock up on in your store cupboard, fridge and freezer and how to cope with being vegetarian when you are out and about and on holiday. Now on to the recipes. 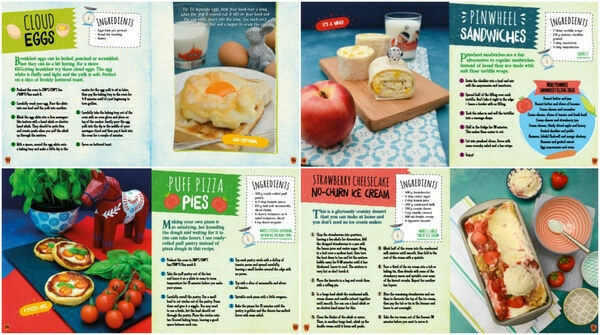 This book is aimed at 9-11 year old children and the recipes are simple enough for them to try, but they should always have adult supervision and some help with the cooker, electrical gadgets and chopping. You might want to make some of the recipes with younger children, giving them some easy jobs to do while you handle the chopping and cooking. Older children (if they have experience in the kitchen) and adults should be able to tackle the recipes fine themselves. This chapter starts with health and safety and ingredient tips before moving on to the recipes. Cloud Eggs - a fun breakfast idea with meringue like egg whites and soft dippy egg yolks. Chocolate Chip and Raisin Pancakes - another special breakfast treat the whole family will love. Pinwheel Sandwiches - a recipe and guide to making pinwheel sandwiches as well as a list of optional fillings. Sweet Potato and Carrot Soup - a delicious, healthy soup that's easy to make. 10 Minute Bean Burgers - our favourite burgers which are mashed together in one bowl, then cooked. So, so good! Puff Pizza Pies - another favourite in our house and quick to make are little puff pastry pizzas. Quick Green Spaghetti Sauce - an easy sauce for pasta whizzed up in a blender or food processor. Spinach and Coconut Dal - a simple dal that's made in under half an hour and super tasty. I hope now you've read a bit about the book you will think about buying it as a gift for any young people in your life or for yourself. I also have three copies to giveaway, if you would like to win a copy, follow the below steps. Leave a comment telling me who you would give this book to. This giveaway is open to readers who live in the UK. Disclosure: Rafflecopter collect information for entries, this is purely to follow entries and to choose a winner. None of your data will be passed on to anyone else or used for any other purpose. The winners' address details will be passed to the publisher then I will delete the email. I do not hold on to winner's info. The publisher will be posting the books out to the three winners who will receive one copy each. I will give the book to my son as he loves cooky with me. It's always good to spend time cooking with kids. It's so important they learn how to cook healthy home cooked meals they leave home. It will set them up for life. It sounds like you put a lot of love and hard work into the recipes - congratulations on the book being published! Thanks Monica, it was certainly a new experience. I was rather nervous about it. Congrats sound amazing ! my daugther is vegetarian ! Oh then this is the perfect book for her, well depending on her age. congratulations Jac - looks like a great book for kids and adults. The design looks fun and colourful. And are those your photos - they look great too. Thanks and yes the food shots are my photos. I tried to make them as colourful as I could. What a great resource for parents. Yes it's nice and simple with all the info you could need. It looks fabulous! Well done! I bet Ted would like to learn to cook with this. What a good idea Sarah, although I am sure you have already started him in the kitchen. I would give your lovely book to my son, as she is keen to make more meat free meals for his family. I pointed him to your website, so I know he would love this book. Awww thanks Janice, I hope he tries it out. I am so excited for you what a fantastic project. Your recipes are awesome and I will definitely be spreading the love with this one. My daughter who is 9 has recently decided not to eat meat, and I am looking for recipes to give her more variety in her diet, and make sure she is getting enough protein. She would love a book of her own. I would love this for my daughter who we are bringing up vegetarian. I would love for her to learn how to cook. This would be perfect for my young veg-curious niece. I would share the book between my 4 vegetarian daughters. They have never eaten meat in their lives. As they've grown older they have become more fussy about what they eat, as children do! It would be great to encourage them to eat the food they have made themselves. Also, with all the facts and information covered in the book, it would be good for them, when faced with the usual attacks from meat eaters, to have enough knowledge to argue their cause in a well informed and educated manner. My daughters are 13, 11, 9 and 5. It's an ideal time to teach them to cook. Looks gorgeous id give it to my nephew! Did you do the fabulous illustrations too? Congratulations on this amazing book! I would love to give it to my vegetarian daughter! I would keep it for myself as I'm always looking for new vegetarian recipes to try. Hi Jacqueline! Congratulations! How exciting to see this beautiful book out. I can't wait to order it and share it! I would give this book to my grandchildren! To my sister, she loves cooking! I would love to give this book to my Granddaughter. I would give it to our middle child who has just turned veggie. I'd give this to my brother, my nephew needs more vegetables in his life. I'd give this to my sister and nephew. I would keep the copy for me and my daughter. We cook vegetarian recipes all the time and the information looks so interesting and informative. My daughter has been a vegetarian since she was 5 she is now 10 and loves experimenting with different foods. I think being vegetarian makes you think more about diet and nutrients and learning is always fun together. I would give this to my daughter for her to use with our granddaughter. I've been a vegetarian for almost 50 years, and my daughter and son-in-law are vegetarian, but my 3-year old granddaughter is not vegetarian, mainly because of pressure from the "other grandparents" (!) who decry raising a child without meat. 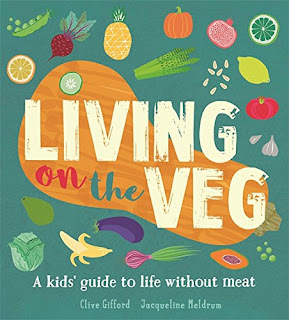 I would hope this book will give my daughter the confidence to stand up to them and make her household fully veggie. I'd give it to my daughter. I've been thinking about making more of our family meals vegetarian and this would be a great way in for both of us! It looks so happy, so 'anyone can do it' and the truth is people pick up (and use) the colorful, easy books. I hope you do well, I'm sure you will.